Aredian is a pre-agricultural and nonindustrial world lacking adequate development for its economy to become prosperous. It is a Non-Aligned world dominated by human sophonts located in the Aredian Subsector of Far Home Sector. 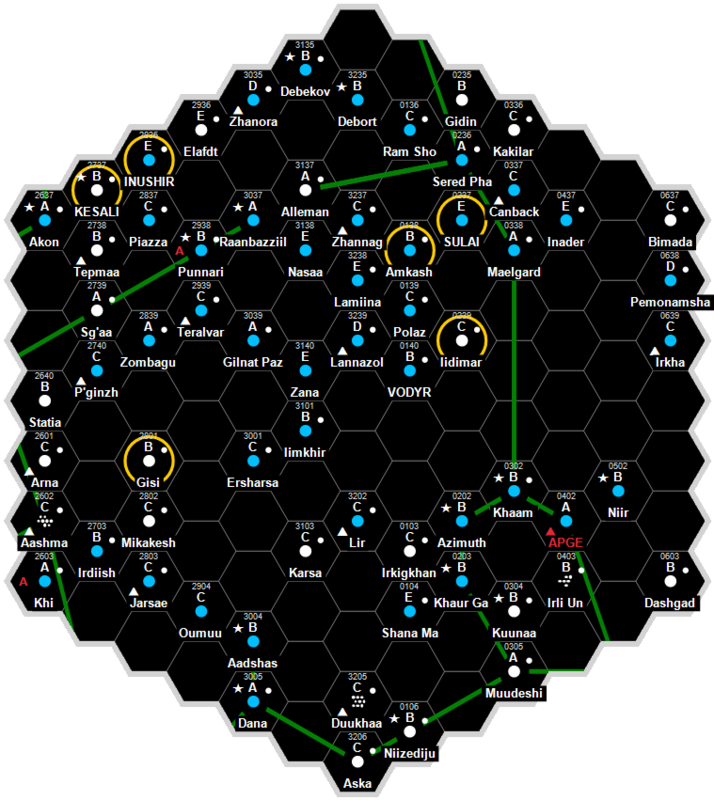 The Aredian system is a part of the Pador-Aredian Cluster. The primary is Lokis, a white subgiant star. It has a luminosity of 12 Sols, a mass of 2 Sols, and a diameter of 3.618 million km. The inner system consists of (II) a vacuum worldlet, (III) a trace atmosphere inner world, and (V) a corrosive atmosphere inferno world – orbital positions (I) and (IV) are empty. (VI) Aredian orbits within the habitable zone and is designated the mainworld. (VII) a sparse stony planetoid belt, (VIII-I) a small gas giant, (VIII-II) a ringed large gas giant, and (IX) a small ice giant form the outer system. Many of the worlds retain satellites. (VI) Aredian is designated the mainworld. It orbits Lokis at a mean distance of 2.68 AU (400.9 million km), within the habitable zone. It has an orbital period of 3 years 38 days and a rotation period of 40.5 hours. The axial tilt is 19 degrees. Aredian has a diameter of 7,764 km, a density of 4.47 g/cm³, and a surface gravity of 0.49 G. The world is geologically active. Its atmosphere is rated as Dense, with a mean surface pressure of 2.43 bar and a composition of 77% nitrogen (N2), 21% oxygen (O2), 1% argon (Ar), and 1%, water vapor (H2O), carbon dioxide (CO2), xenon (Xe), neon (Ne) and other trace gases. Approximately 37% of the surface is covered in seas of liquid water: average tidal ranges exceed 0.1m. Mean surface temperature: 48°C. The climate is rated as Hot and experiences minor seasonal changes during the local year. The atmosphere is active and strong weather systems driven by the star and the seas sweep across the globe. Total surface area: 189 million km², Land surface area: 119 million km², Water surface area: 70 million km². Aredian, the mainworld, has extensive, abundant native life, with complex organisms inhabiting every ecological niche. Their metabolic functions drive the process of atmospheric renewal. Aredian has a frontier quality starport. Aredian possesses a Technology Level of TL–4. Common Communication technologies for this TL include: Telephone and telegraphs, widespread printing. Common Power Generation technologies for this TL include: Early electricity, hydrocarbon internal combustion. Land: Trains and early automobiles. Water: Clippers and steam ships. Air: Dirigibles, balloons, very basic rockets. Aredian has a Self-Perpetuating Oligarchy government. This page was last modified on 22 August 2018, at 18:52.